Almost at the end of my month-long sojourn in Ubud, Bali, and I've got that end-of-summer feeling when suddenly I realise this isn't going to last forever. I've also been thinking about how different this trip is, compared to my usual way of travelling. I can’t remember the last time I went somewhere, particularly overseas, and didn’t visit any of the local attractions. I've been here four weeks and I haven’t been to Ubud Palace or any museums or art galleries. I haven't been rafting, taken a cooking class, climbed Mt Batur at sunrise (though I did do that a few years ago). I went to Ubud market for the first time yesterday (and didn't buy a thing). Much as I love Lonely Planet guides, I didn’t bring one this time. Nor did I re-read the "bible" of Ubud: Eat Pray Love (there are references to it everywhere here). I had a basic tourist map - until I lost it. I didn’t bring a phone that could Google maps for me. This was all by design, not chance (except for the losing the map part). I wanted to travel differently, without an eye on stories I’d have to write (I might not write any stories about Bali, actually, besides these blog posts), and I really came seeking peace and time to work on a few writing projects that deadlines always kept me from starting back home. I've been an un-tourist in Ubud, and it’s been surprisingly liberating. (Next I’ll try to stop taking a notebook and camera everywhere, but one change at a time...). It's been a dose of slow travel, quiet travel, even old-fashioned travel reminiscent of a time before TripAdvisor when it took much longer to reach faraway places and when you got there, you stayed a while. It's not so much a holiday, just life in a different place, at a different pace. I like it a lot. I've spent whole days reading, writing and swimming at Michi Retreat, where I stayed for most of my month, the longest I've ever been resident at a hotel. I felt like a character in a Graham Greene novel, particularly at the eccentric, arty Michi, which was built as a creatives' retreat anyway. I rode my rented scooter to Ubud some days, through villages whose names I didn't try to find out. Had $4 foot massages that I just enjoyed. Went to yoga classes in the open-air, timber-floored studios at the very Ubudly named Radiantly Alive (in travel-writer mode I would've gone to Ubud's famous Yoga Barn too, but I wasn't, so I didn't). Sometimes whole afternoons would slink by while I hung out in organic cafes with new friends. When we got tired of talking, we eavesdropped on conversations at neighbouring tables (out of curiosity, not malice) - which was always edifying. 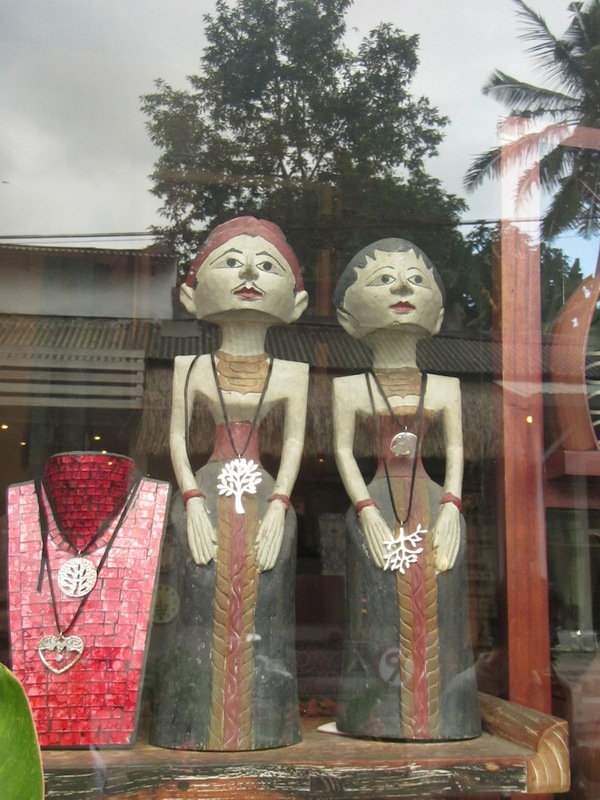 I'm open to most things but Ubud does wacky like nowhere else. Whatever you want, you can find it here: infrared saunas, magic-mushroom shakes, flaming hula-hoop performances, miracle coaches (a step up from life coaches). I overheard a girl saying she was going to get her hair "decontaminated" (um, what?) and every second person seemed to be on a 12-day detox. One of the nightspots here is even called Laughing Buddha. Getting back to those cafes ... Eating well, preferably organically, is the number one pastime of un-tourists in Ubud. From the “orange amazing healing” juice in Dayu’s Warung to the “Om omelette” at the uber-chic, shoes-off Clear Cafe, whose mantra is "Eat the food you wish to be" - Ubud's edible experiences are in a class of their own. Clear Cafe's more-delicious-than-it-sounds vegan chocolate “mylk” shakes, made with coconut ice cream and locally harvested cashew nut “mylk”. 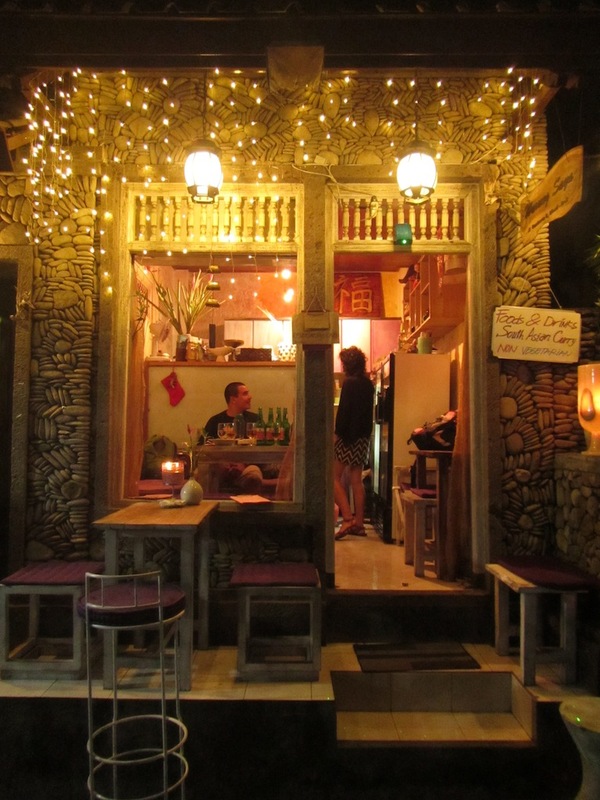 The best little restaurant in Ubud, literally: Warung Saya, a cubby-house in Jalan Gautama and the toughest place in Bali to get a table because there are only two - tables, that is. Looks so pretty at night with fairy lights framing its open window that passersby stop to take photos. The iced cappuccinos at Casa Luna, whose Australian owner Janet de Neefe runs Ubud Writers’ and Readers’ Festival every October, which began as a healing project in the wake of the first Bali bombing 10 years ago. 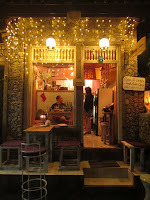 Also Seniman "coffee studio" for its recycled-bottle glasses and designer rocking chairs. A rice fields walk that ends at Sari Organik, a two-tiered cottage in the a sea of green with volcano views, and incredible salads. You can even pick your own ingredients and they'll make them into a meal for you. 5. On the way to Sari, you'll pass the relatively new Cafe Pomegranate, a cafe-in-a-circus-tent with 360-degree views of those rice fields; I love that they give you a rattan fan and a small brass bell to ring for service. It's my last day in Ubud tomorrow and I'm not ready to leave. It's not that I haven't seen or experienced everything; I know I haven't and one more day won't change that. It's more like leaving someone you've only just met but know you want to spend more time with. I don't just mean Ubud, it's the whole un-tourist thing. I'm not sure I can ever go back to the other way of travelling now, not completely. Part of me will always be looking for the un-tourist way, just as Ubud taught me. So we stay up talking into the wee hours, linger over coconut smoothies, swap email addresses at the airport. Come back soon, Ubud says. I know I will. This sounds suspiciously like a 'real' holiday, relaxation, discovery, chill time, and eyes wide open - how very novel. Lovely piece and is encouraging me to plan a 'real' holiday. Thanks Lou. Good to see you dropping out of your usual frantically paced life and relaxing for a change my friend. The last few times away with Chiharu and the kids I've hardly photographed at all. Just enjoyed being in Japan (or Thailand or Singapore) and having a family holiday. If I get some great shots that's fantastic, if I don't so be it. There's always another story to write or photograph to make. Let them wait I say. Hey Lou, glad to see you're enjoying your 'time-out'. It sounds amazing. I meant to say to you a while ago, I met this fab woman at AFTW last year - Jan Cornall - she's often in Bali... you should hunt her down. Another writer. Great character. I know you're leaving Ubud, but not sure if you have any plans to go back so thought I'd share the contact anyway. Having spent today organising travel vaccinations and tax, I need you to stop making this sound so idyllic..
Ha, yes, sorry about that. Truth is the above was a time away from all those details of our travel writing lives. Sigh. I'm about to leap into vaccinations and packing for multiple trips for my next work assignment now too. But hey, good problems to have, no? Is this Bali's most unusual hotel?